Special deal! Save 37% while supply lasts. 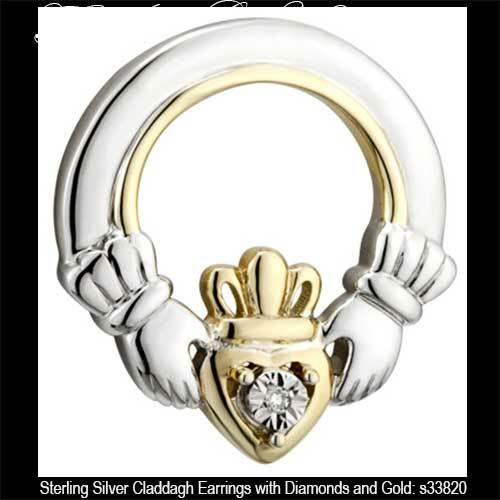 Sterling silver Claddagh earrings feature studs with diamond hearts along with 10K gold accenting. These sterling silver Claddagh earrings feature diamond studded hearts along with 10K gold accenting that includes the heart and crown. 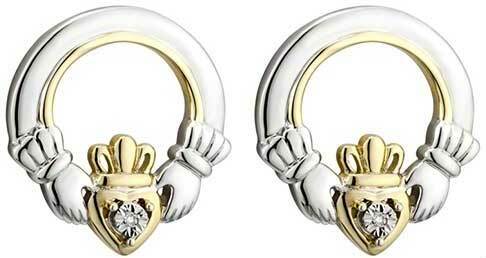 The diamond Claddagh stud earrings, with push on butterfly backs, measure just under 1/2" wide x just over 1/2" tall. These Irish earrings are made by Solvar Jewelry in Dublin, Ireland and are gift boxed with a Claddagh history card that is complements of The Irish Gift House. Sterling silver Claddagh necklace features gold accenting along with Celtic knot-work and a diamond heart.